The batting conditions got tougher as the day got on and the rain got heavier, but by the end of day 1, our batsmen got to 5/120. Scott Mackenzie (35) and Declan Owens (33) were the key with a strong middle order partnership to get us 1st innings points. 3rd Grade played out on the uncovered wicket at Waratah 3, and got a full days play in. Liam Wilson lost the toss and the boys were sent in, but they batted brilliantly to reach 189 before declaring to make Stockton bat out the last overs of the day. Jackson Bell top scored with 60, and opening pair Josh Payne and Dalvir Rana had a great stand of 50 to get the boys going early. In reply Stockton are now 3/27 with wickets shared. 2nd Grade and 4th Grade were away to Stockton and were unfortunately unable to get on the park. 5th Grade were also sent in on an uncovered wicket at Sportsground no. 5, and like the 3rds, they did a great job to reach 146 with Harry Compton (34) and Blake Chandler (33) the top scorers. 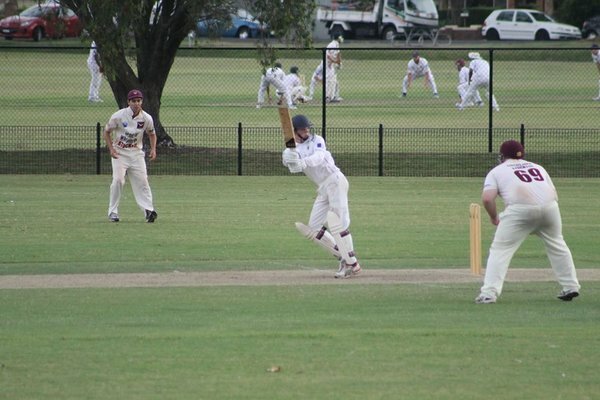 Unfortunately they didn't get a chance to defend their total against Merewether Lions with the game abandoned in the first over of their bowling innings. C5s had a big win on Waratah 4 in a fast paced and exciting finish. Batting first, Arif Hussain (76), Asad Abbas (34) and Malik Ahsan Shahid(37*) put together a great lower order fightback to post 9/215 from their 35 overs. South Wallsend pushed the run chase to the wire, getting to 8/209 at the end of their 35 overs. The D1s will no doubt be cursing the rain gods as they missed out on a likely victory against Gateshead. Bowling first, they finished off Gateshead for just 69 with skipper Matthew Quinn (5/20) the chief destroyer. The game was abandoned very early in the afternoon due to the rain, with the boys left stranded at 3/21. Well done to all teams, and a special mention to our curator Simon Porter for his efforts to get both pitches on at Waratah oval.